Lenovo has announced the Lenovo IdeaPad Tablet P1, a 10.1-inch tablet set for release with Windows 7 OS, alongside two tablets running Android 3.1 Honeycomb. The IdeaPad P1 will offer a 1.5GHz Intel Atom processor, up to 2GB of RAM and the option of either 32GB or 64GB SSD storage, it also has expandable storage with a microSD card slot. The tablet also comes with a 1280 x 800 capacitive multi-touch screen, Bluetooth, WiFi, a USB 2.0 port and an optional 3G modem. The IdeaPad P1 weighs in at around 790g making it heavier than both the 10-inch Samsung Galaxy and the Motorola Xoom tablets. You'll be able to video call friends using the front-facing 2MP camera, however with no camera on the back don't expect to get too snap-happy. 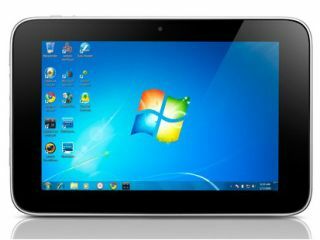 Windows 8 is tailored for the touch screen market and is set for release soon, so it will be interesting to see how well this Windows 7 tablet does in the market. Lenovo IdeaPad Tablet P1 UK price and release date are still yet to be announced by Lenovo, however, it is to launch later this year in the US. Lenovo also launched two tablets running Android 3.1 and offer dual-core Nvidia processors. The Lenovo IdeaPad Tablet K1 is designed for entertainment and and Lenovo's ThinkPad Tablet which is more business-focused, coming with productivity apps and data encryption software.